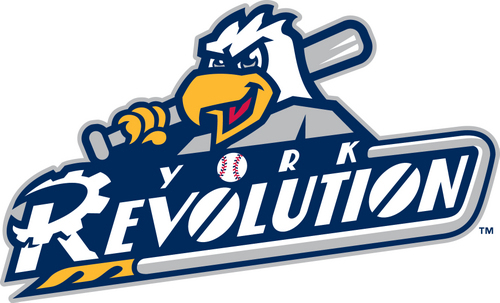 (October 18, 2018) — “Revs Time” will return to Downtown York on Friday, April 26, 2019, when the three-time Atlantic League champion York Revolution kicks off its 13th season at PeoplesBank Park. The 2019 season will feature 70 home games, including 11 games against the High Point Rockers, the newest addition to the Atlantic League of Professional Baseball, who will make their debut in the league’s Liberty Division in 2019. The Rockers will first visit York on Thursday, May 9, and play the Revs 21 times in 2019. 2019 will also mark the return of the Atlantic League All-Star Game to York. The Revolution, which first hosted the mid-summer classic in 2011, will present the 2019 All-Star Game on Wednesday, July 10. Revolution officials have begun developing another exciting, family-friendly promotional schedule that will feature giveaways, celebrity appearances, and entertainments acts. Season tickets are already on sale, and individual tickets will go on sale in late Winter 2019. The team has also begun selling memberships in the 1741 Club presented by UPMC Pinnacle, the exciting new hospitality space currently under construction in the center of PeoplesBank Park’s skybox level. The Club will open in the spring 2019. Additional information can be found at www.1741Club.com. The Revs will start their season at home and be in PeoplesBank Park for 23 of their first 37 games. The home schedule will feature 33 weekend games, 8 Mondays, 10 Tuesdays, 10 Wednesdays, and 9 Thursdays. The team will be on the road for 70 games. The coming season will mark the latest chapter in the “War of the Roses,” the Revolution’s ongoing rivalry with the Lancaster Barnstormers. The Revs will welcome the Stormers to the White Rose City nine times in 2019 and travel to the Red Rose City 10 times, with the team with the best head-to-head record claiming the Community Cup. The Revolution will face the defending Atlantic League Champion Sugar Land Skeeters 10 times in York and 10 times in Sugar Land, Texas, through two road trips there. The Revs will face the Long Island Ducks in 20 games, the New Britain Bees in 19 games, the Somerset Patriots in 21 games, and the Southern Maryland Blue Crabs in 20 games. The 2019 ALPB schedule is divided into two 70-game halves, with the first half ending on Saturday, July 7, and the regular season ending on Sunday, September 22. The first-half and second-half champions in each division will qualify for the 2019 Atlantic League playoffs. If one or both teams win each half of their respective divisions, the team(s) with the next best overall record will qualify for the postseason. Both Division Championship Series matchups will take place the week of September 22, 2018, with the Atlantic League Championship Series occurring during the week of September 29. The full 2019 York Revolution schedule is below. Game times will be announced later as the 2019 promotional schedule begins to take shape.